"Hamas and ISIS control the Temple Mount; police not arresting terrorists in the heart of the capital," said MK Moshe Feiglin. Deputy Knesset Speaker Moshe Feiglin (Likud) attacked the Israeli police's decision to close the Temple Mount to Jewish worshipers on Sukkot. Sukkot is one of the three Jewish pilgrimage holidays that in ancient times required Jews to travel to the Temple in Jerusalem - a practice maintained today. The decision to bar Jewish worshippers comes following an onslaught of violent Arab riots against police and Jewish visitors to the mount. 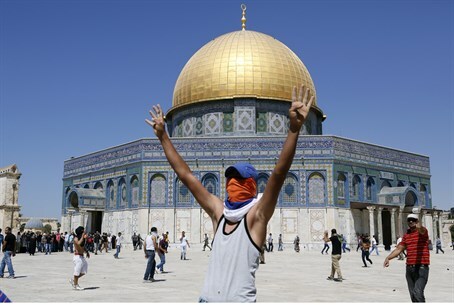 "Hamas and ISIS have taken control of the Temple Mount for the fourth day [of Sukkot]. The Prime Minister's words claiming victory over Hamas and sending a message of deterrence to Hezbollah are crashing into a rock on the Temple Mount in Jerusalem" Feiglin said Sunday morning. "Hamas representatives and ISIS members have been able to barricade themselves at the mount. Meanwhile, (Yitzhak) Aharonovich (Minister of Internal Security - ed.) prevents police from arresting terrorists in the heart of the capital, which would free the mount from their hands and allow Jews to ascend to the Temple during Sukkot." According to Feiglin, this is a crushing defeat against terror organizations, and there may be a very grave price to pay for it on both the Gaza border as well as the North. "The person responsible for this is the Prime Minister (Binyamin Netanyahu). I call on the prime minister to order an immediate removal of all Muslims from the Temple Mount during Sukkot. This would allow Jews to visit freely and safely on the holiday." Not to be completely deterred, thousands of people came to the Western Wall Sunday morning to attend the Birkat Kohanim (Priestly Blessing) ceremony. Present were also Chief Rabbis Yitzhak Yosef and David Lau. Despite the mass of visitors, police closed the Temple Mount for Jews, stating that the decision was made ​​following a security assessment.